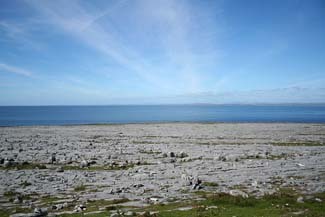 The Burren is one of the largest karst landscapes in Europe, a small portion of it has been designated as Burren National Park and it is the smallest of 6 national parks in Ireland. There are no marked trails in the Park however many people visit the park for walking. The Burren National Park contains examples of all the major habitats within the Burren: Limestone Pavement, Calcareous grassland, Hazel scrub, Ash/hazel woodland, Turloughs, Lakes, Petrifying springs, cliffs and Fen.